The New SIM Free BlackBerry Torch 9800 inspires & brings together your BlackBerry smartphone with a new touch, slide design & OS. Delivery is expected in Early October. We will not charge your card until the goods are ready to ship. If the actual price is lower, you will be charged the lower price. If the final price is higher, we will contact you to make sure you want to go ahead with the order or not. 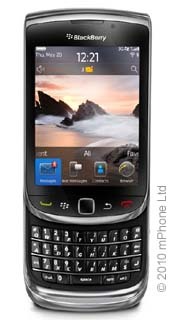 Pre Order Blackberry Torch 9800 SIM Free for use with any GSM or 3G SIM card / line including all those on UK networks like O2, Vodafone, Orange, T-Mobile, Three and Virgin (pre-pay and contract).